It’s been quite a while since I wrote anything on bipolarmums.com but I’m happy to tell you that I’m finally back. A few of you have been asking why I stopped writing. It wasn’t a conscious decision, just a few things got in the way and before I knew it months had passed. The first reason was, I lost my nerve. After years of being unashamed to speak about my Bipolar diagnosis in public – even on national TV, I suddenly became nervous about sharing so openly. The fact that my children are now a little older (7, 9 and 11) added to this. As did the fact that I started a new job and wanted my colleagues to know me well first, before they found out I have Bipolar. I also went through a few really rough periods of anxiety and depression – triggered by stress in my previous job. You might have been through this yourself, and if so, you’ll know that it’s a struggle to get through daily life – let alone help support others. But life has settled down now, and I’ve decided to start writing again. My children love me and are more interested in games on the iPAD than reading my blog. I work for an organisation that helps people with disabilities and mental illness in developing countries – so if any workplace should understand it’s them. And I’m feeling well and able to give back to others again. 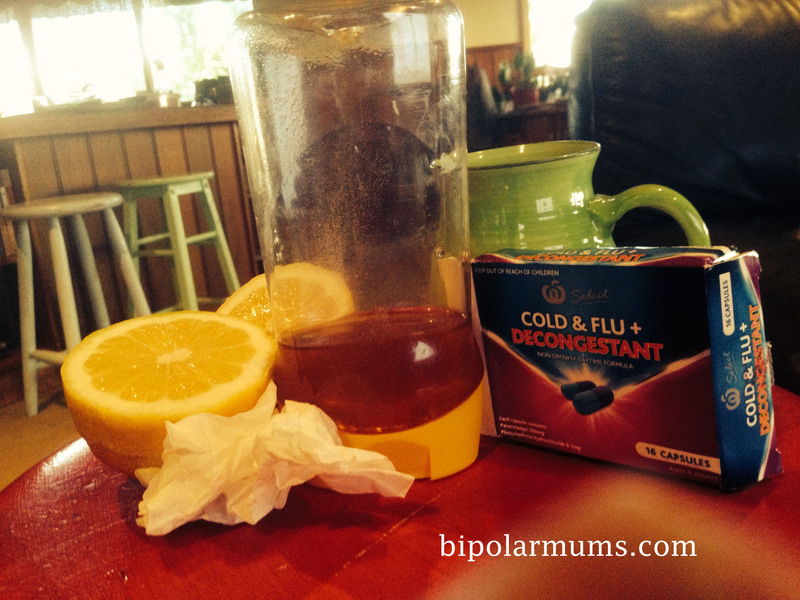 Look out for more articles about balancing Bipolar and Motherhood in the months ahead. And make sure you join our new Bipolar Mums Facebook group (you need to apply to join as it’s a closed group so our comments stay private). The Facebook page is a great way to share what’s going on with others – and to support each other through tough times. With an impending restructure at work, my days have been a bit more stress-filled than usual. My team of six has been reduced for now to a team of three – and we’re doing our best to keep things going despite the sense of doom and gloom about the place. In the midst of all this turmoil, staff have been dropping like flies… with record numbers of sick days. As for me, who rarely gets sick enough to justify a day off work, I’ve been day-dreaming about taking a “sick day” to just, well… decompress. Spending a day battling the flu wasn’t quite the “sick day” I’d been hoping for. In my mind, I imagined I’d time my “sick day” for when the kids were at school/kinder so that I could sleep in ’till 10am and then go out for a brunch with my husband (who is currently studying at home). I then planned to dig out one of my craft projects – which have been ignored for the past 2.5 years since I went back to full-time work. And I’d end the day by picking up my kids (who would be surprised to see Mum rather than Dad waiting outside their classroom) and then welcoming them home to home-cooked cookies. My work has an official name for days like this. I know it’s “technically” fine to take a mental health day, but I don’t know about you – I still struggle with the idea of taking a day off when I don’t physically appear sick. Go to work with a hacking cough or a dripping nose and people encourage you to go home and rest up. But arrive at work crippled with anxiety, depression or stress and no-one is any the wiser. It’s easier to hide feelings of despair, depression and hopelessness than a fever. I worked through months of acute depression – and no-one at work noticed, until I made a point of telling them about the struggle I was having. Not that I advocate hiding your mental illness from your employer. I have let my manager know about my condition – and I’d like to think my employees feel comfortable enough to share with me. Yet, I’m well aware that just telling your staff that they’re technically allowed to take time off to deal with mental health issues doesn’t make it easy to actually do it. We need senior staff to model that it’s actually ok.
Today, I finally got my sick day. Only problem was, it really was a sick day. And it struck on a Saturday morning. Sure I got to spend the morning in bed…. but that was where I stayed for most of the weekend. And as for a leisurely lunch with my husband – well let’s just say that I wasn’t feeling up for any kind of date. Instead of feeling free to enjoy a Monday off work… I found myself dealing with 1000’s of tissues and an aching body that didn’t want to do anything but lie down. Moaning that “this isn’t what a sick day is meant to be like…” my husband kindly pointed out what I was after wasn’t a “sick day” but a “sickie”. Hmm… I’d better be careful what I wish for next time. 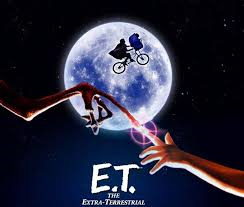 Tonight I decided to introduce my kids to a movie classic – ET. I had vague memories of a very cute Drew Barrymore playing with the Extra Terrestrial and thought my space-Leggo mad kids would love the movie too. Less than 10 minutes into the movie, all three kids were hiding under the quilt… terrified by the sight of the weird, bald little alien. I kept reassuring them it would get better, but when ET seemingly died 45 minutes later and all three kids had tears rolling down their faces, I was kicking myself for my choice of movie. Who knew the lessons ET can teach? His strong words reminded me of some I’d spoken myself eight years ago after his birth, when I had gone through an awful experience in a public hospital’s psychiatric ward. I swore never to go back to that place – and for a long time I couldn’t even drive past it without feeling physically sick. And yet, things change. Things that seem scary somehow suddenly no longer hold the same fear. As the years tick by, the anger and fear are still there – but somehow less vivid. And the bitterness begins to fade. Two days ago, I walked back through the doors of that psychiatric ward. This time, I didn’t arrive in the back of a police divvy van. I wasn’t held down by police and injected with tranquilizers. I wasn’t leaving behind my precious week-old baby. And I wasn’t declared mentally insane and kept behind locked doors. This time, I drove to the hospital on my lunch-break and walked through the front doors by choice. I put one foot in front of the of the other until I arrived at the reception desk. I took a few deep breaths, smoothed down my jacket and tried to look as sane as possible as I asked for the Head of Nursing, who had promised to take me on a tour. My husband couldn’t quite understand why I went back. He said nothing could force him back there. And I understood why. The best way I can explain my need to go back there is that I wanted to face the thing that frightened me most. I’m not a brave person normally (to be honest I found some scenes in ET a little scary myself). But I wanted to see if visiting that psychiatric ward all these years later would help me see things differently. As a mum, I help my kids to face their fears. I talk them through it… trying to show them that what they’re most scared of (in this case, being attacked by a alien on the TV) is actually not all that scary. I thought it was time to listen to my own mum-advice for once. Stay tuned for my next post – seeing if psychiatric wards have changed in the past eight years. I’ve never thought of myself as brave person. I’m the type who ducks and covers my face when someone throws me a football (or a set of keys). I’m not fond of putting myself in dangerous situations… you’ll never find me posting a photo on Facebook of myself sky-diving and I shudder at the thought of getting surprise hot-air balloon ride tickets for my birthday. I’m all for exploring new countries – but my idea of a fun holiday does not include bungee jumping, white-water rafting or eating snails, scorpians or other unidentified objects. But something’s happened this week that has made me muster up all my bravery. I’ve spoken before about the most horrific time of my life… being taken from my home in a police divvy-van eight days after the birth of my first baby and being locked up in the high-dependency unit of Maroondah Hospital’s psychiatric ward . Many of you reading this will have endured similar things: the mistreatment at the hands of “carers”, the scariness of being in a mixed ward with mentally unstable men, the loneliness… desperately trying to get people to understand you, but being met with looks of fear or annoyance. Which is why when the Head of Nursing at Maroondah’s psychiatric ward invited me this week to meet her in a fortnight for a tour of their new facilities, I found myself feeling the opposite of brave. When I asked my ever-supportive husband if he’d come with me, he flatly refused. I can’t say I blame him. Instead of enjoying the first six weeks of our first baby’s life, we both endured a type of hell-on-earth which we wouldn’t wish on anyone. While his wife was declared insane and committed to a locked ward, my husband juggled his shock of what had happened with the needs of a tiny newborn. While most new mums struggle to get out of the house at all, my husband bundled up our baby son and brought him into a psych ward so I could have 30 precious minutes cuddling him. When I finally came home, we were both so traumatised that we couldn’t stand to hear what the other had been through. It took six months of counselling to finally accept what had happened and move on. Still, for the past 8 years, my stomach has still felt sick whenever I’ve driven past the building where the psych ward is located. So, why would I even consider going back? Because I’ve now realised that unforgiveness and bitterness was only hurting one person… me. I’ve made a conscious decision to forgive the staff in that ward for the way they treated me. And to be honest, I’m also a tad curious. The head nurse told me that things have improved “out of sight” since I was a patient there. The ward now has a separate mood-disorders wing for women. And she gushed in her email about the array of activities that patients can now take part in. Part of me is skeptical that things have improved. But I need to know that they have – because I couldn’t live with myself if others are still living in the hell-hole that I escaped. When I left that ward, I promised to be the voice for those who couldn’t speak up for themselves. And so, in two weeks, I’ll walk alone into the building that is the place where I lived through the most horrible moments of my life. I’ll put one foot in front of the other – and I’ll smile and be courteous to the staff. But I won’t be looking at the fancy new ward or plethora of activities to see if things have improved. I’ll look into the eyes of the patients. Have you ever had to be brave – to face something or someone in your past? Has the experience made you stronger? Any tips for how to muster up bravery in situations like this? I have to admit it – I love a nice hot cup of tea. There’s something about being forced to stand quietly, waiting for the kettle to boil that seems to calm my spirit. And don’t get me started on the lovely feeling of a warm cuppa nestled in my hands. When I have time – and have someone to share a cuppa with – I love to get out one of my favourite loose leaf teas and use my favourite red teapot. The English have it right – a cup of tea and a good chat can fix almost anything. 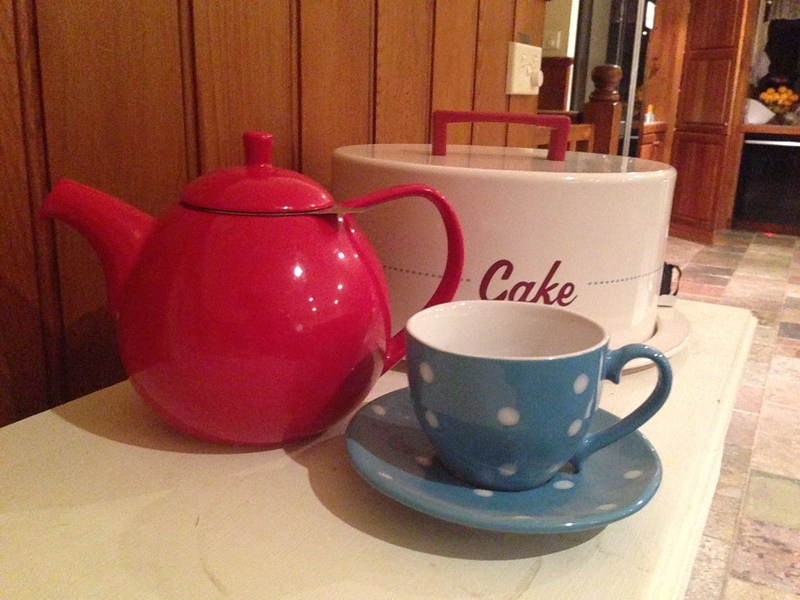 My favourite red teapot – a gift from my hubby. I was standing by the kettle just now, fixing myself a cup of tea (sadly, a cup-for-one with a teabag), when something struck me. It doesn’t take much to turn a cup of boiling water into a cup of tea. Within seconds of dunking a teabag, the water has been infused with the colour and flavour of the tea – turning it from clear to murky brown. Watching my cuppa change colour just now has got me thinking. I wonder how much the bitterness I’ve been feeling about having to live life with a mental illness has been tainting my life? It’s not fun having a mental illness. It’s not fun dealing with the side-effects of various medications. And I’ll be the first to admit that somewhere, deep inside me, I still hold some bitterness about the cards life has dealt me. Sure, I can now see a bigger purpose for my life – complete with my bipolar diagnosis – but that doesn’t mean I don’t still sometimes struggle with accepting it. Most of my friends and family will say that it’s perfectly ok to feel bitter about being diagnosed with a mental illness. The only trouble is, it’s been almost twenty years now since my original diagnosis. And these feelings of bitterness have a nasty habit of acting like a tea bag: infusing me and my life with anger and regret. The effects may not always be obvious… but this bitterness got a nasty habit of bubbling to the surface when I’m feeling at my lowest and want something to strike out at. It’s not something that I want my kids to see in me. And so, I’m left with a choice. Do I allow this ‘bag’ of bitterness to continue to colour my life? Or do I make a conscious effort to finally accept my diagnosis – acknowledging that it will have an ongoing impact on my life and that I will most likely need to continue taking medication for the rest of my life to keep it under control? And yet – looking at the effect tonight that one small teabag had on my big cup full of crystal clear water, I’m determined to not let my diagnosis taint the rest of my life. Sure it’s almost certainly always going to be part of me – but it’s not going to affect who I am – or the life I was created to live. Do you feel bitter or angry because of your mental illness or something else in your life? Have you had to take steps to deal with your bitterness? I’m sure other mums would love to hear about and learn from your experience. I like op-shopping. There’s nothing like walking into an opportunity shop, with a purse filled with coins, and walking out with some amazing recycled finds. 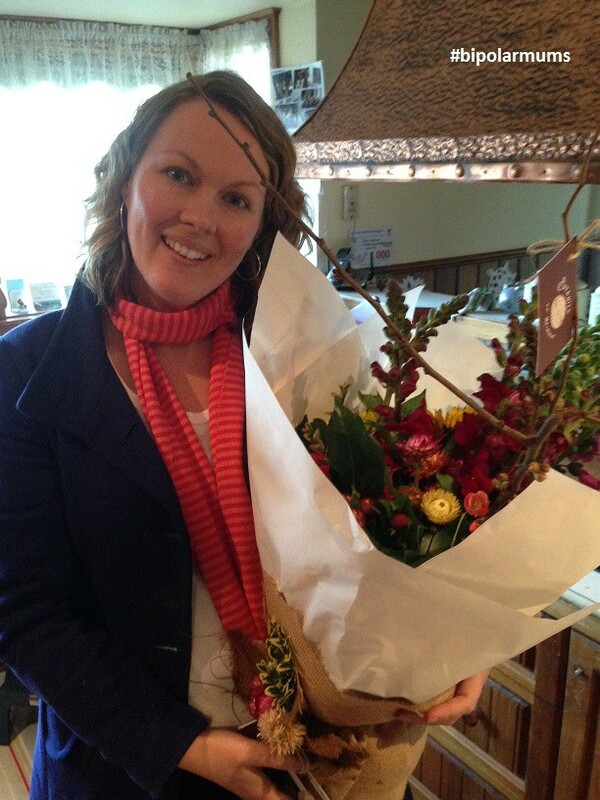 At the moment, my favourite winter jacket, scarf and leather boots are all from op-shops and cost a total of AUS$18. The boots are a brand I really like and had never been worn, the jacket is a stunning blue wool and just looking at the gorgeous orange striped scarf makes me feel happy. Me rocking my op-shop jacket and scarf! I’ve written before about how much I love taking something set for the rubbish dump and turning it into something beautiful and useful. One of my favourite rescued pieces is the white buffet, sitting in my family room. The last time I was in an op-shop, I came across a pile of old sheet music. Something about the beautiful old music, printed in the 1920’s and carefully wrapped in brown paper, caught my eye and I couldn’t leave without buying it. I had no idea what I would do with it – my piano playing skills are a little too rusty for such complicated pieces – but I knew that I couldn’t leave it behind. Today I woke up to the sound of rain. Being Saturday, I was looking forward to spending some time with the kids – and a crafting afternoon sounded just about right. While the kids made cards for friends, I pulled out some supplies and set about turning the sheet music into something special. 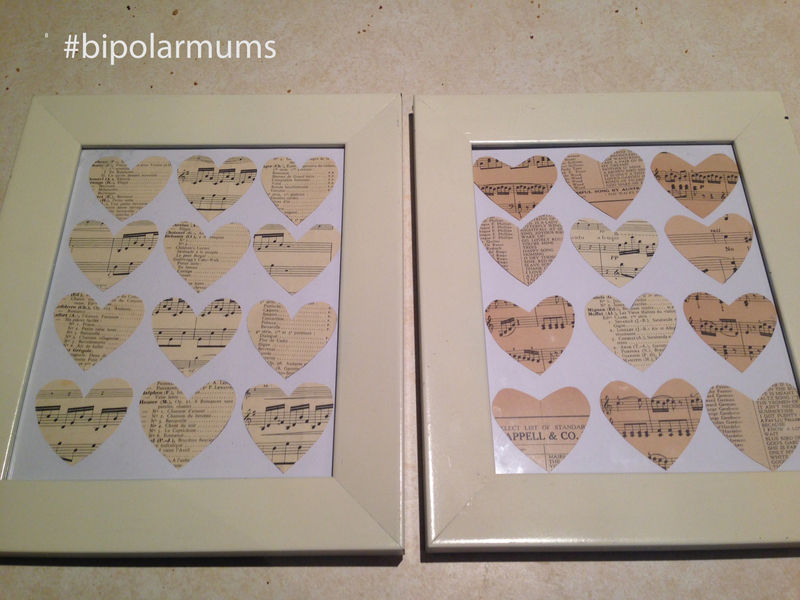 A few hours later, I had turned the unwanted music sheets into a couple of cute heart pictures (see below) and a bunch of unique cards for friends’ birthdays. Hanging the pictures on my wall, I was struck again by how something that seemed old and not good for anything but the bin, was – a couple of hours later – something so beautiful. Sometimes life can leave us feeling so down, that we start thinking we’re no longer of value to society. I know when I was sitting alone, locked in a psychiatric ward after the birth of my first baby, I started thinking that my life was pretty much over. The fear and loathing in the eyes of the ward staff affirmed this thought – that I was no longer an educated, articulate young woman respected by those around me… but someone who had to be kept heavily medicated and away from the rest of society. At that time, I pretty much felt like those sheets of music, once highly-valued but now abandoned and destined for the bin. And yet, looking at the new pictures on my wall – made from the recycled music sheets – I was reminded of my own journey. Here I am, eight and a half years later, not only living with mental illness, but thriving. Being diagnosed with Bipolar Disorder at the age of 18 was a huge blow. And it’s something that I’ve had to learn to live with over the past 19 years. But it hasn’t meant the end of life as I knew it. I have still gone on to become a wife, a mother, an employee and a friend. Like the sheet music transformed into something very different, my life may not look exactly like it used to – but it is beautiful in an equally special and valuable way. My prayer is that everyone reading this who is going through hard times, will realise that while your life may not look quite like you had planned, it may well in the end turn out to be even better than you originally hoped. Don’t ever think that your life is not worth living. Don’t ever give up. Does anyone else love seeing the potential in things? Got any stories or photos of your favourite op-shop finds?